It was on a similar, nearby, slope where I couldn’t keep up on the descent. We started hiking in earnest 10 years ago and I humiliated myself on a small group climb in the Italian Dolomites. A thunderstorm was brewing and our guide had to short-cut to get to the van, leaving a fellow hiker in charge of our group. I was too slow on the steep descent, I was endangering the group, and the guide resorted to Plan B. Ever since that shaming experience, I’ve struggled to increase my descending speed to be at least average without understanding what the problem was. Switching to forefoot striking in 2009 was my first big breakthrough and it’s taken 7 more years to have more than incremental increases in my speed. I’d been inching closer to staying on Bill’s heels and then in April of 2016, I began matching his descent speed on all but the trickiest, near-vertical, rocky segments. The final breakthrough came with being absolutely precise about my stance, my posture. For me, the final missing piece for speedy descending was maintaining perfectly upright posture: the steeper it gets, the more treacherous the trail surface, the straighter I stand. It’s all about keeping my center of gravity perfectly aligned over my feet. I continue to use the shorter gait characteristic of forefoot striking to keep my feet under me as well. Of course, our instinctive response to difficulty is to round forward towards the fetal position, whether it’s wind, cold, fear, or pain. And with steep descending, there is the additional delusion that we have to lean forward to look for the next foot placement. Fearing falling into the tangle of submerged logs, I resorted to the classic defensive posture of curling forward. You’ll see some people on the trail that are fast and stable and have lousy posture. They are the lucky ones: they’ve unconsciously settled into a string of counterbalancing compromises in their alignment that is highly effective for them, and that’s good enough. But for people like me that haven’t been so lucky, following a formula works. Below are the critical pivot points for a good hiking stance and at the end of the piece are simple exercises to improve your positional control at these points. A quick, easy way to understand your habitual stance is to back up to a corner or post. Let your feet be hip width apart and slightly forward, then bring the ‘crack’ of your buttocks, your upper back, and your head to the the corner. For most of us, the challenge is getting the head to touch. Notice if you had to lift your chin to make contact. The ideal is to be looking out to the horizon with your chin level and your head effortlessly touching the wall. After you’ve succumbed to “See, it’s fine” that most of us resort to after uncomfortably ramming our head back, accept that it isn’t fine, that there is work to do. Let your head drift forward to its usual home and re-establish your level chin. Ask for the opinion of a helper or use your fingers or fist to learn how far forward of ideal your head lives. Slim’s plumb line is good at his head & shoulders but not at his hips. 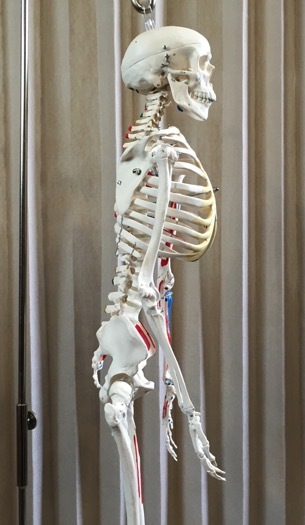 Another way to think about your optimal stance is using the notion of a plumb line hanging from the ceiling along one side of your body. Ideally, the plumb line drops through the center of your ear, shoulder, hip, and slightly forward of the ankle bone. Most of us live in the “head forward” position and may have other alignment issues as well. With either assessment tool, your ideal posture should also reveal lumbar curve. That’s the desirable curve inwards at your low back, at the waist. A rough guide as to “How much?” is that you should be able to slip a hand between your low back and the wall when standing at the corner. You should retain this low back curve on the trail too. I can feel my sack-like day pack lift off of my low back letting a pleasant bit of air through when I’m standing well on the trail. “I have to hang my head to see where my feet are going” is a common spoken or unspoken defense of the destabilizing, forward head position on the trail or anywhere. It’s a good try, but it’s not true. When you curve your neck forward and drop your head, you’ve instantly shifted your center of gravity forward of your feet and are poised to slide or fall. It’s a small but powerful adjustment to habituate to--minimizing the bend in your neck and instead tilting your head so your gaze drops towards your feet without shifting your center of gravity. Think ‘pivot’ instead of ‘bend’. It’s the same motion you use to inspect the top of your shoulder, but without rotating your head to the side. You can see far more of your shoulder if you keep your neck upright. Return to your corner, contacting with your buttocks and upper back, and find your best head position. Again, don’t force the head to the wall at the expense of lifting your chin. Instead, encourage your head to drift towards the wall just until your chin starts to lift. Hold this aligned position and slowly drop your chin to your chest without bending the neck. The back of your neck will lengthen as you draw your chin into the notch between your collar bones instead of it moving away from your chest. The spot where you’d next plant your foot when walking should now be in view. Notice that you haven’t disturbed your center of gravity by using this position to drop your gaze to the ground. Any corner will do to check your head position. 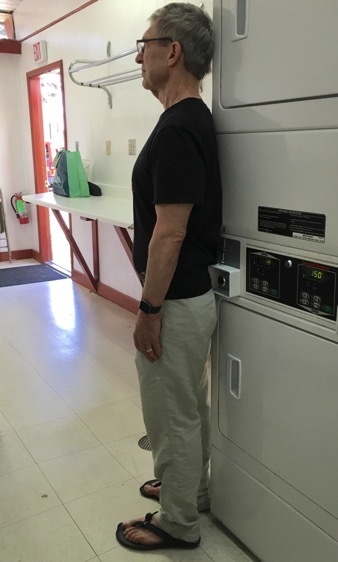 Many of us unconsciously over-exaggerate our low back curve (hyperextend) when we consciously straighten our postural alignment or shift to pivoting the head at the top of the neck. A nice counter move is to engage your upper abdominal muscles—the muscles below the breast bone. Pilates uses the image of “knit your ribs together” that might help you get the hang of it. You may get a pleasant sense of your core being more stable when the upper abs are engaged. These 4 corrections—upright posture, head drifting back, chin dropping down, and engaging my upper ab muscles—are the centerpiece for keeping my center of gravity over my feet, which is key to keeping me stable during steep descents. A more subtle refinement is letting your hips swivel as you walk. Our Puritan heritage is considered by some as the root of our cultural habit of keeping our hips still but that’s not what they are supposed to be doing. With each step, your pelvis should be moving in a subtle figure 8 or infinity sign shape. I keep working with this to have optimal body mechanics, to feel a continuous flow of movement through my feet, ankles, knees and hips. As you start refining your posture and hiking stance, note if a subtle tightness across your hip joint is pitching you forward. Tightness in the front hip joint will keep pulling you into the fetal position, a configuration that contributes to instability on the trail. Choosing thin, flexible footwear and having sufficient foot and ankle mobility allows me to go straight down the fall line of the trail, which adds to my speed. Being able to descent on the fall line is the fastest way to go. Landing on the balls of my feet instead of my heels drives all of my body weight into a small patch of the earth, making my forefoot strike “stick,” which keeps my feet under me. When descending on trails that feel like they are downhill from a ball bearing factory, widen your stance and bend your knees more. Kind of a ra-ta-tat rhythm with widely spaced feet helps keep me off my bum, even in sandals with minimum traction. My poles were a foot longer than those of a man descending in front of me. We use 18L packs that are so lightly engineered that they literally roll up into a ball—we have a strong bias towards lightweight gear. The essential feature for a good descent pack is to have both a waist and a chest strap. Our straps have zero padding. We wear them pretty tight for descending to keep the pack from shifting side to side or up and down. We laced bungee through the exterior daisy rings of our packs to cinch the contents should we have the luxury of a small load. I also like to keep my shoulder straps short so that my pack rides relatively high on my back. “Strap it down or put it inside.” Keep your pack compact and don’t let shoes, water bottles or other items swing like a pendulum when you walk. Any such extraneous motion will diminish your stability and the endurance of your core muscles. A pair of trekking poles is very helpful if you are pushing your descent speed. Poles give me more confidence when I’m moving beyond my comfort zone because they decrease the odds of falling if I stumble. 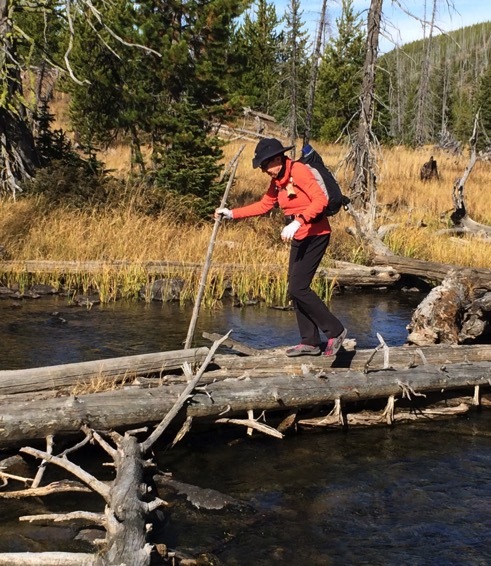 We only use them on our longest hikes because we think it’s beneficial to have the strength and balance challenges both with and without poles. Lengthen your poles so they are really, really long for descending. 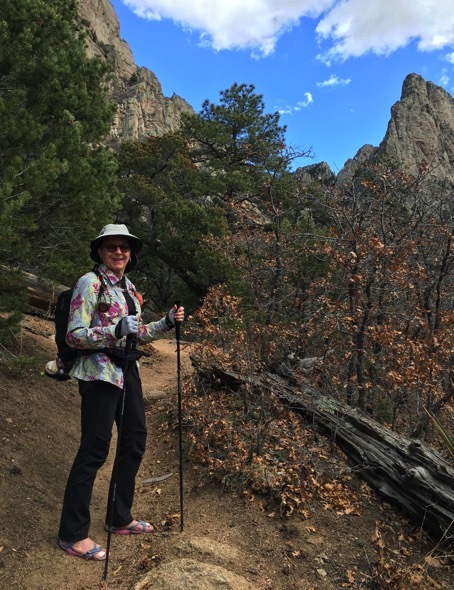 Most people have their poles 4-6” too short when descending which forces them bend forward to reach their poles rather than having their poles meet them—there goes their upright stance. When on flat ground, my forearms are almost at a 45 degree angle at my elbow from horizontal rather than the prescribed level position. We opted to buy ultra-light, fixed length poles and sized them for descending. My poles are 10 cm (about 4”) longer than the proper length for my height. I’ve used them a year and have no trouble on ascents because of their excess length and I feel that pulling rather than pushing with my poles adds to my upper body conditioning on ascents. “Shoes not boots!” is our battle cry. If you wear boots, consider unlacing them to just below the ankle so you have full range of motion of your feet and ankles when descending. We’ve seen many hikers hobbled by their restrictive boots on steep descents. They often lag behind their bootless companions while walking duck-footed or sideways to navigate around the restrictions of their cast-like boots on steep, rocky trails. You can see the fear on their faces, which is reflected in their fear-response curve of their necks and bodies, as they slowly pick their way down difficult trails. Fold-up thin & flexible, an aggressive sole, a small collar, & a speedy lacing system to fine-tune fit on the fly. We are huge, huge fans of minimalist shoes and think they are the best for descending because they are highly flexible. Being able to fully point your foot to make contact with the ground with the ball of your foot can shorten the distance of the reach by inches compared with leading with your heel, which also helps maintain your upright posture. A stiff boot denies you access to the flexibility and huge range of motion of your ankle. It can take months or years to adapt to “mini’s” as we call them, but they and the required forefoot striking gait are extremely advantageous on steep trails. They allow one to fully capture the talents of your strong, flexible feet as well as spare the knees from traumatizing pounding on descents. Our current favorite hiking shoes are Vivobarefoot Trail Freaks, which are also available in waterproof versions. They are thin and flexible with aggressive traction and have a narrow collar (opening at the ankle) to keep the rocks out. And they have a Speed Toggle lacing system that makes adjusting the tightness of the laces a snap. The down side is that they are over $100 when on sale and they wear out too fast by our standards but we keep buying them because they are the best compromise. 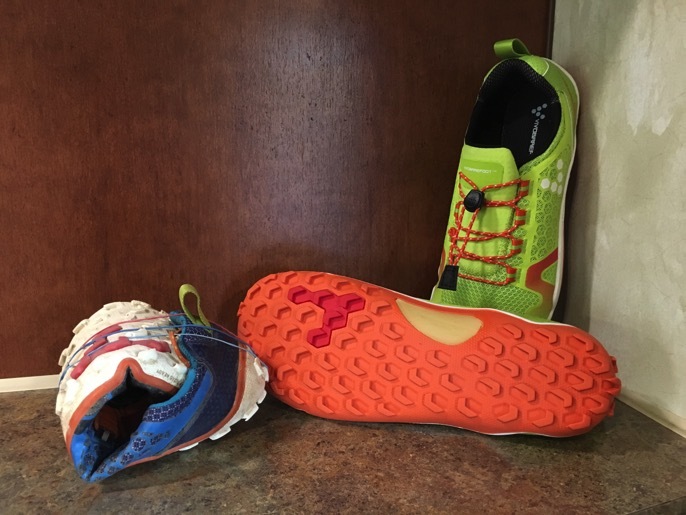 If your choices aren’t limited by wide feet like mine are, other ‘mini’ manufacturers like Merrell or New Balance may have a more durable alternative for you. Save your toes and toe nails by buying your hiking shoes a half size to full size larger than your street shoes, snugging your laces before descending, and perhaps wearing extra socks to help keep your feet in place inside the shoe. Trail running shoes with a narrow collar are superior for descending because the foot can’t slide forward as far. We often leave the lacing looser near the toes for their comfort and tighten the laces near the ankle to prevent sliding. In contrast, triathlon shoes are generally a poor choice because the collar (opening) is large to facilitate a speedy on/off. Opening up the back muscles makes it easier to stand well. Be sensible here. Don’t hurt yourself. Don’t do things that you know to be perilous for your body. Protect your neck by supporting the weight of your head with a pillow or your hands. Look online for other options to accomplish the same goals that are more appropriate for you if these aren't suitable. Most of us live in the world in a head-forward, slouched shoulders stance that results in a rounded back condition known a kyphosis. The sooner you start reversing this position, the sooner you’ll be effortlessly standing tall on and off the trail. Lie on the floor on your back with a rolled yoga mat or rolled big towel under your upper back just below your armpits. Now rotate your arms into the “stick-‘em-up” position, encouraging the backs of your hands to drift to the floor, and relax. 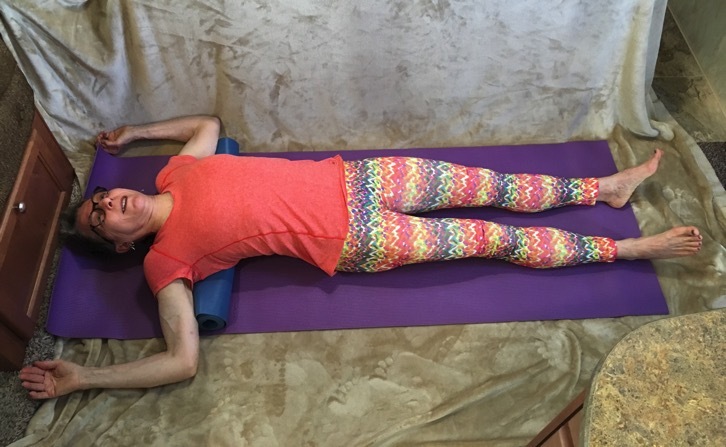 Chill-out for 5-10” and let gravity do the work on your upper back muscles, coaxing them to bend in the opposite direction from where they live. Not that you want all of the curve to exit from your upper back, just some of it. 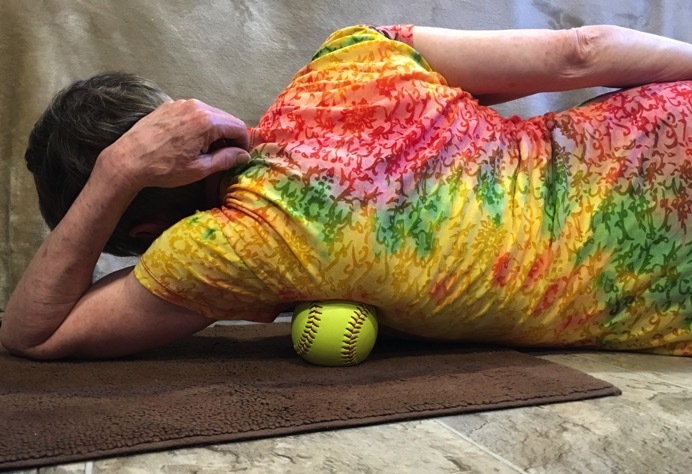 Rolling over a ball or roller can be a delightful release for the back muscles. 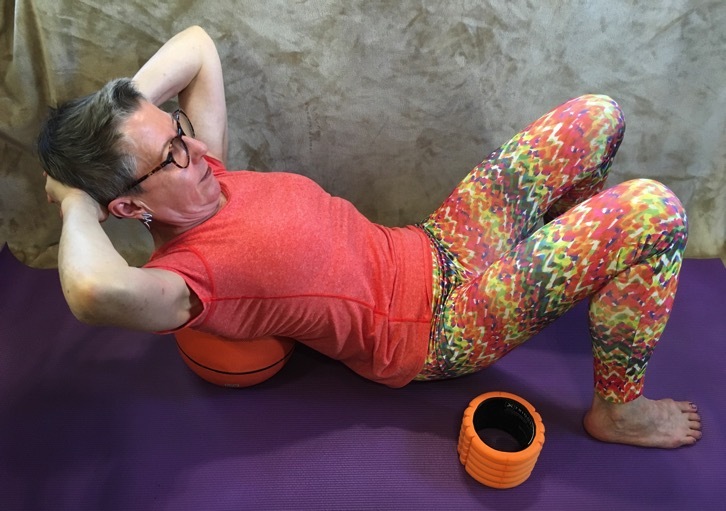 After resting over the roll with it just below the tips of your shoulder blades, roll on to a side, lift yourself up with your arms, and settle down onto the roll with it under the length of your spine. The lower end of the roll should be at your low back, not under your buttocks. This position will stretch muscles that may have shortened from a hunched posture. Relax in this position for 5-10”. Use the same “stick-‘em-up” arm position and feel the subtle opening of the front body. Not for everyone, this can be a luscious stretch and release for weary back muscles at the end of a long day on the trail. It counters the forward curve of your upper body and seems to send the message to the back that “It’s over, you can rest now.” A four-square ball is the most gentle way to start. A slightly deflated basket ball is a bit harsher. And if you have a stubby Trigger Point roller, that will work as well though it is very harsh. Whatever you roll on, start out with the object just above your low back with your knees bent, feet on the floor, and interlaced hands supporting your head with your chin moving towards your chest. If this position already feels threatening, you may not want to proceed. This simple myofascial release may increase your upper body mobility. Slowly lift your buttocks a little bit off of the floor and shuffle with your feet to advance your ball or roller a little higher on your back, then slowly roll back and forth. Cautiously advance a little farther up your back until you’ve worked the entire length. Quite startling at first, but it should be a divine release for your back muscles. Again, be cautious with this one. I’ve done this regularly for decades and it can still be quite sensational. This is a myofascial release technic that may increase your shoulder mobility which can make it easier to stand well. Side lie on the floor with a softball below your armpit and slowly roll around in search of tender spots. If you find some, pick one, give it your full weight for 20 seconds, and then move on to a new hot spot. If you have knotted tissue in this area, this technic may quickly release it. An easy way to target the upper abs to ‘knit your ribs together’ is to sit on the floor with your knees bent and feet on the floor like the position for rolling on the ball. Straighten you back, lift your arms so they are parallel to the floor, and hold it. Doing an isometric exercise instead of reps is a more useful way to strengthen your abdominals because they do their job by being in isometric contraction when on the trail or standing around. If this ab strengthener position is a loser for your body, find a more appropriate ab exercise online or from a trainer. 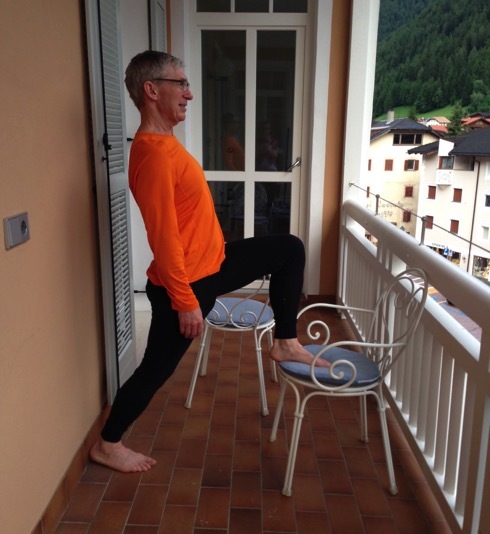 This is an easy, do almost anywhere, stretch for the hip flexors. Good to position yourself with something to hang onto for this one because you can be a bit tippy in it. Go for stretch in the front of the hip of the leg planted on the floor, keeping the lower knee straight. Strongly stand upright but avoid leaning back. Stand with your feet widely spaced with both knees bent a little and then shift your right knee forward and towards your right foot and notice that the left foot has unweighted a bit. Draw an arc with your right knee to your side and then backwards, noticing that there is more weight in the left foot now. Repeat the motion on the left side by letting the left knee drift towards the left foot, then arcing to the side and back. Now it’s back to the right knee. Your pelvis will be moving in a figure 8 form. Once you have found the motion, reverse the direction by initiating the figure 8 with your knee and pelvis by going back first, then arcing to the front. If this movement in standing is baffling, try creating the figure 8 pattern by rolling your pelvis while sitting in a chair. Once you get the hang of it in sitting or standing, replicate the motion while slowly walking. The motion won’t be as distinct when walking but will be felt as more of a side-to-side or front to back motion. I find it to be an engaging challenge to concentrate on this hip motion during tedious stretches of trail. If swiveling your hips was too, too annoying, this top of the foot stretch will be easier. The basic form is to kneel on the floor with the tops of your feet long rather than having the toes turned under. If you can, sit on your heels. If you feel no stretch, lean back a little letting your knees lift off of the floor. Still nothing? Move on to something else because they are probably sufficiently open. If however sitting on your heels is painful, especially for your knees or just isn’t going to happen, elevate your bum with pillows, books, or a basketball until the position is tolerable. Not surprisingly, your goal will still be to stretch the tops of your feet so that you can sit on your heels. Restoring mobility so you can strongly point your toes will make your forefoot striking gait on descents more effective. With a little experimenting, you’ll find that you can stretch the tops of your feet in standing by reaching a shoeless, pointed foot far behind you and pressing the top of it into the floor. We should all be incorporating these postural details into our daily lives all of the time, on and off the trail. Keeping the head aligned over the spine and feet dramatically decreases back strain, especially with a pack on. Think “leverage” here: the more you tip forward, the harder the back muscles must work to counter the extra load. Stabilizing one’s core muscles also decreases back strain. We constantly use the “back up against a corner” to get feedback about our posture. We often do it before going out the door in the morning and it’s helpful to anchor your posture before putting your pack on at a trailhead. Almost anything will do for feedback, like a sign post or the end of an information board. This piece is dedicated to Jeffrey of Albuquerque whom we met on a hiking trail in the Sandia Mountains there. He honored us with his thoughtful curiosity about how and why we were doing things differently from other hikers. Jeffrey is a quick study was already experimenting with our non-traditional strategies when we saw him a week later on the trail. We were in our beloved Italian Dolomites in July of 2016 when we made 2 very difficult descents in a single day. One was down a narrow trail from a peak through loose rock on a perilous slope. Lower down, we did about a 2,000’ descent on a less dangerous trail that was largely timber and gravel steps that we and others typically slowly worked through. On this day however, we literally jogged down the gravel stairway after briskly and confidently walking down from the peak. We both knew our very upright stance made us fantastically faster and more stable on both segments of trail than when we last made those same descents 2 years ago. 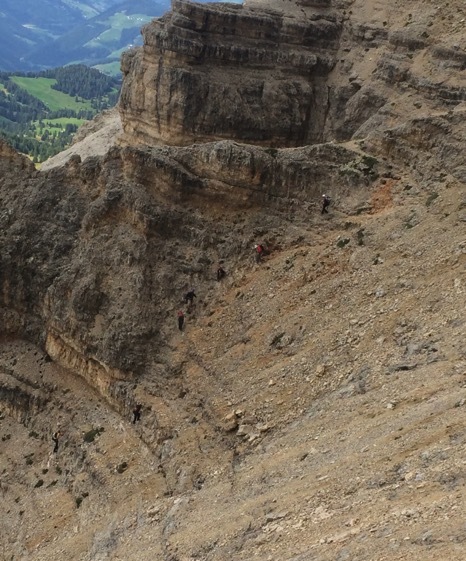 I was delighted to learn 2 new ways to short-circuit discomfort on steep descents. For my knees, I found that doing gentle heel striking for a minute or so about every 5 minutes, would sooth brewing discomfort. I continued primarily using a forefoot gait, but mixed it up a bit with heel striking and a more flat footed position if I sensed any knee discomfort. Even inserting this gait change in at the end of a long day would sooth my knees. When I become weary on the descent at the end of a long day, I tend to lean backwards. (For those of you who know the paved section of the Larch Mountain trail near Multnomah Falls, that is a place I am especially prone to the tilt.) I believe the lean is compensation for core muscle fatigue, which is effective, but my hip flexors are then prone to going into spasm. The hip flexors are muscles that cross the front of the hip. A simple intervention identified by a massage therapist is to lift my bent knees a little higher than usual and also to slightly flex forward at the hip joint, or lean slightly forward. I works like magic. On descents, I both watch for my shoulders drifting too far back and also periodically switch to the marching-like gait, which has abolished that very troublesome hip flexor pain.